Today’s guest post is by Justine Duhr. Justine owns and operates WriteByNight, a writers’ service helping folks like you to write more, write better, and accomplish their goals. For more solutions to common writing problems, download this free writer’s diagnostic now. When Joe Bunting invited me to contribute a guest blog post to The Write Practice, I was thrilled. After all, this is a thriving community of dedicated writers hungry for craft discussion. It’s a writing coach’s dream come true. What is not a dream, however, what is in fact a writer’s worst nightmare, is when your creativity fails to flow, when despite your best efforts the words fail to come. When your tried-and-true writing process fails you. Which is exactly what happened with my first attempt at a post for you, dear Write Practice readers. But that revision never came. After five painful weeks of planning, trying, and never managing to actually rewrite that post, I came to a realization. I can’t write this piece, not right now anyway, I said to myself and to Joe. But I can write something else instead. That something else is this post you’re reading right now. Thousands of discarded words and one stress ulcer later . . . ta-da! Why I was unable to write the piece I intended is a question for another time. What I’m concerned with here is what such experiences of creative blockage can teach us about our writing process. What do we do when our writing practice unexpectedly goes off the rails? When writing feels like the worst thing in the world? First off, let’s acknowledge that our creativity is largely a mystery to us. We are conscious of only a tiny portion of the creative process we undergo that (hopefully) ends with an original piece of writing. Given this state of affairs, we better get used to the idea that when it comes to our writing, we know very little and are in control of even less. Sometimes inspiration arrives as an avalanche, the words tumbling from our minds to our fingers and spilling onto the page. Other times working on a piece of writing feels like hacking away at a glacier with an ice pick. I know which creative experience I prefer, and I’ll venture a guess at your preference too. But your writing doesn’t care what you prefer. The best we can do is show up and be open to what may—or may not—happen. I’ve written elsewhere about writer’s block, what it is, what causes it, and what the heck to do about it. When we find ourselves unable to write, it can be helpful to resist the temptation to label that difficulty a block. It’s not a block: it’s an obstacle, a hurdle, an impediment. Most importantly, it’s data, data we can use to inform our decisions about how to move forward and respond productively to an unproductive situation. Obstacles can be overcome, hurdles jumped, impediments bypassed. Consider this: Out for a walk, you encounter a “road closed” sign. There’s a barricade barring access to the route beyond. The data is clear enough. You can’t go this way. Now you have a decision to make. Do you turn around and head home, or do you find a new road? 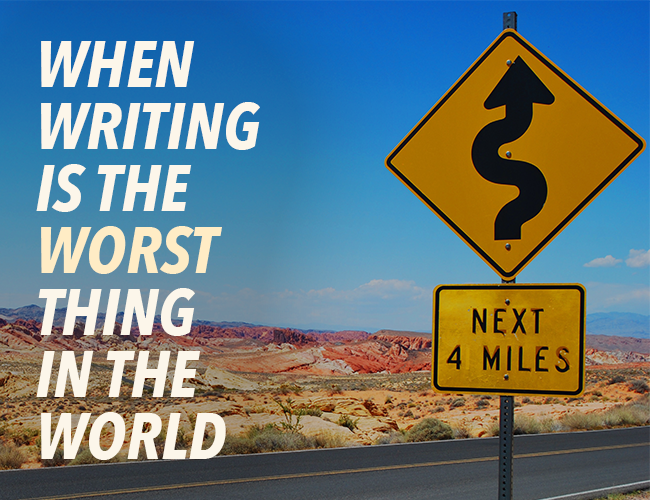 Writing trouble reflects on your skill as a writer about as much as road work reflects on your skill as a walker. Not all paths are available to us all the time. Ultimately, the resolution to my blog post battle was to be found in my own frustration-induced realization: I can’t write this piece. But I can write something else instead. This was my new road. As soon as I chose to understand this struggle as a communication from myself rather than a deficiency in myself, I was able to open up the process rather than close it down. And you can do the same. Easier said than done, though. I’m not gonna lie, this post has been pretty ice pick-y for me. That last paragraph, I worked on it for half an hour, deleting, rewriting, cutting, pasting. That last sentence, same deal. This one, too, and the next. Writing is defined not by success, but by failure. Failure to write what we want, when we want to; failure to ever fully realize on the page the vast potential of what we see in our head; and sometimes, failure to make words at all. If you choose to be a writer, you choose to have writing kick the crap out of you every day for the rest of your life. We are small, writing is big. It is ever present and never ending. For better or worse, writing practice does not make perfect. It makes more practice. What do you do when your writing process gives you trouble? Let me know in the comments. Read over a piece of writing you’ve struggled with and left unfinished. Write for fifteen minutes (in stream-of-consciousness style, if you wish) about the experience of leaving this piece and returning to it now. What is your creativity telling you? What will you do differently this time around? How will you pivot? When you’re finished, post your practice in the comments section. And if you post, be sure to leave feedback for a few other practitioners.